The Outer Banks of North Carolina (OBX) represent the easternmost coastal areas of the state, from Carava to the north and Cape Hatteras and Ocracoke Island to the south. The area generally consists of Ocracoke, Hatteras and Bodie Islands, narrow strips of land separating the Atlantic Ocean from both Albemarle and Currituck Sounds. Located inland in Pasquotank County, Elizabeth City is a regional service center for the OBX. Manteo, seat of Dare County, represents another service center for the OBX. Situated on Roanoke Island, the town represents a way point along US 64 ahead of the mostly undeveloped route west to Williamston. The Outer Banks of North Carolina (OBX) are notable historically as the home of the Wright Brothers, who pioneered flight. They are also home to Roanoke Island, site of the first English-born child in North America, Virgina Dare. The OBX is also well known for its five light houses. 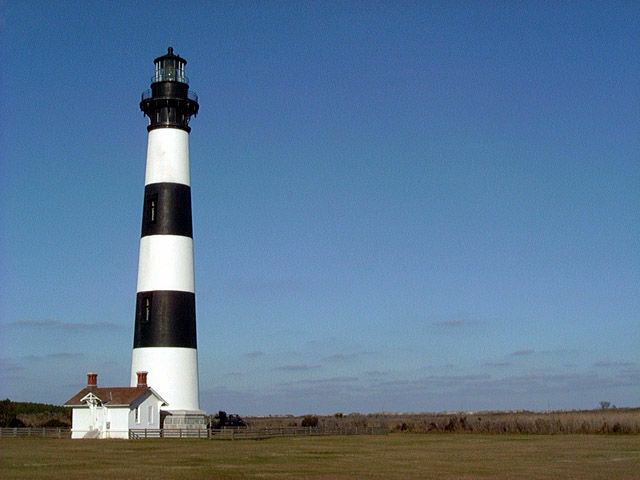 Bodie Island Lighthouse, located within the Cape Hatteras National Seashore near Oregon Inlet. The other OBX light houses are: Corolla Light, Hatteras Light, Ocracoke Light and Cape Fear Light. Photo taken 12/16/01. The main industry here is tourism, as Northeasterners and Midwesterners flock to the cool beaches during the warmer months of the year. With increasing numbers of year long residents and redevelopment of areas damaged by hurricanes, the Outer Banks continue to grow as both a vacation destination and a retirement community. The OBX letter combination on standard passenger vehicle issue license plates in North Carolina are reserved for local residents of the Outer Banks. The state of North Carolina successfully applied for future Interstate status for the U.S. 17 corridor to AASHTO on May 24, 2016. Envisioned as a 190 mile plus route, Interstate 87 overall will overlay U.S. 64 east from I-40 and I-440 at Raleigh to Williamston, and U.S. 17 northeast from Williamston to Windsor, Edenton, Hertford and Elizabeth City. When the east end will tie into I-64 remains uncertain, as a number of environmental studies will be required to determine a route through Chesapeake, Virginia. Future I-87 signs were subsequently added at the beginning of various freeway segments along U.S. 17, including bypasses of Windsor, Edenton and Elizabeth City. These sections cannot be signed as Interstate 87 until they connect with a portion of the existing Interstate system. The largest city in northeastern North Carolina, Elizabeth City, or E-City for short, resides along the Pasquotank River north of Albemarle Sound. U.S. 17 is the main highway to E-City, linking it north with Hampton Roads, Virginia and west to Edenton. The corridor doubles as Future Interstate 87, a route proposed north to I-64 in Chesapeake and southwest to Rocky Mount and Raleigh. Through Elizabeth City, US 17 separates into three branches. U.S. 17 Bypass circumvents the city along a freeway to the west. The U.S. 17 mainline loops east into E-City along an arterial bypass west and north of Downtown. U.S. 17 Business navigates through the city center along Ehringhaus and Road Streets on what was the original alignment of U.S. 17. Signed as Future I-87, the Elizabeth City bypass opened in December 20022 to the west of the city limits. When completed, the U.S. 17 Bypass designation shifted to the freeway, and the previous U.S. 17 Bypass route was redesignated as the mainline of U.S. 17.2 With a 70 mile per hour speed limit, the 11-mile freeway provides a high-speed bypass for long distance travelers between Hampton Roads, Virginia and Williamston. Providing the gateway to the Outer Banks from Raleigh and Rocky Mount to the west, U.S. 64 traverses a mixture of agricultural and wetland areas from Plymouth east to Manns Harbor. East from Columbia, U.S. 64 reduces from a five-lane arterial to a two-lane highway, including the lengthy Lindsay C. Warren Bridge across the Alligator River. Beyond the eastern terminus of U.S. 264, U.S. 64 expands to four lanes leading into Manns Harbor. East from Roanoke Island, U.S. 64 takes a four-lane causeway to the span over Roanoke Sound. The route expands into a five-lane arterial from Pond Island to Cedar Island and the east end at U.S. 158 (Croatan Highway) and N.C. 12 (Virginia Dare Trail) at Whalebone Junction. U.S. 64 travels a four-lane freeway from Knightdale east to Williamston and another four lane freeway from Pineridge to Columbia. The freeway east to Williamston is a part of Future Interstate 87. A $356 to $399 million project will widen the remaining two-lane sections of U.S. 64 across Tyrrell and Dare Counties. Included is the replacement of the Lindsay C. Warren Bridge across the Alligator River, and the realignment of U.S. 64 onto the Dare Northern Bypass. A Draft Environmental Impact Statement for the 27.3-mile upgrade was approved in January 2012. 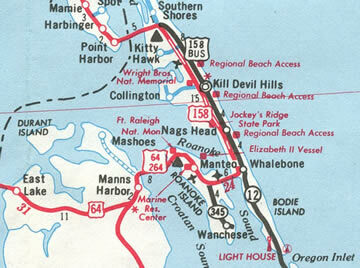 The lone highway connecting the Outer Banks to the North Carolina mainland from the north is U.S. 158. A five-lane arterial with a varying speed limit of 45-55 mph, U.S. 158 Croatan Highway travels southeast from Barco to the Wright Brothers Memorial Bridge. With an elevation generally ranging from 1 to 5 feet above sea level, the narrow finger of land separates Great Swamp to the west from Coinjock Bay and Maple Swamp to the east. The Intracoastal waterway cuts across the peninsula at Coinjock. There U.S. 158 makes an S-curve across a high rise bridge. The 2,507 foot long span opened to traffic in 1986.12 It replaced an adjacent draw bridge to the east. U.S. 158 heads south from there to the communities of Bertha, Grandy, Jarvisburg, Olds and Powells Point with waters of the North River and Currituck Sound spreading to the west and east respectively. Mileposts posted along U.S. 158 increase in count south from the Wright Brothers Memorial Bridge to the eastern terminus at Whalebone Junction. Typical of coastal communities with long strips of development, these aid in motorist navigation for locating businesses, attractions and residential areas along Croatan Highway. An attraction near Milepost 12 in Nags Head is Jockeys Ridge State Park. The park surrounds an area of large sand dunes that reshape themselves every year with the changing winds. Visitors to the park may enjoy in hang gliding, hiking and sightseeing. Prior to 1940, U.S. 158 ended at U.S. 58 in Franklin, Virginia, with the route east from Murfreesboro to Barco assigned as North Carolina 30. 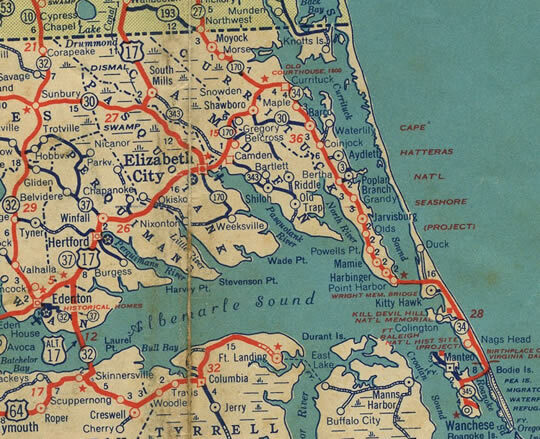 The eastern extension of U.S. 158 to the Outer Banks included a fish-hook shaped route across Roanoke Sound to an end at Manteo. This changed in 1951, with U.S. 64 lengthened east from Fort Landing to Whalebone Junction. West of Barco and North Carolina 168, U.S. 158 reduces to two lanes en route to Elizabeth City. U.S. 158 crosses the Pasquotank River on a pair of two-lane draw bridges to the north side of Downtown Elizabeth City. The US route extends west along a four-lane boulevard (Elizabeth Street) to U.S. 17 (Hughes Boulevard). 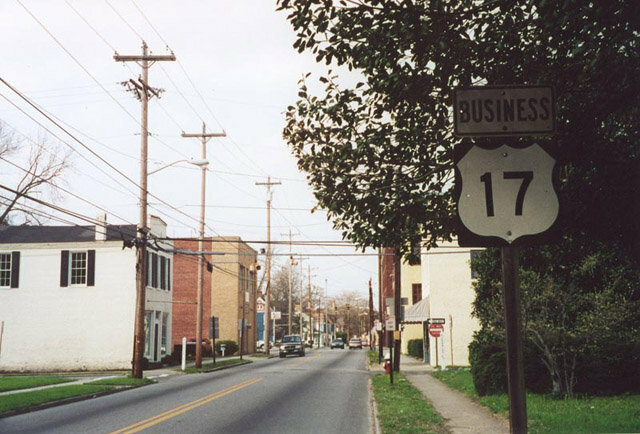 While U.S. 17 Business provides a cut off north to U.S. 17 & 158 along Road Street, U.S. 158 remains routed west on Elizabeth Street and then northeast along Hughes Boulevard as part of a Truck route across Elizabeth City. All U.S. 158 reassurance shields along this stretch include Truck banners. U.S. 17 & 158 otherwise overlap for 11.1 miles north to Morgans Corners. U.S. 264 navigates along a rural route east from Pantego to Enghelhard and north along Pamlico Sound to end at U.S. 64 in Manns Harbor. With completion of the Virginia Dare Memorial Bridge taking U.S. 64 east across Croaton Sound, U.S. 264 was truncated from its concurrency with U.S. 64 east between Manns Harbor and Nags Head. AASHTO approved the formal request to eliminate U.S. 264 east of Manns Harbor on May 30, 2003. Known as Virginia Dare Trail between Southern Shores and Whalebone Junction, North Carolina 12 straddles the coastline along a two-lane alignment through Nags Head, Kill Devil Hills and Kitty Hawk. With a 35 mph speed limit, the beach road is home to a number of condominiums, hotels, vacation rentals, restaurants and other commercial establishments. Beyond U.S. 158, North Carolina 12 spurs 21.3 miles north along a narrow strip of land between Currituck Sound and the Atlantic Ocean through to Currituck County. Following Ocean Trail by a number of beach homes and condominiums, the two-lane road serves the communities of Southern Shores, Duck and Corolla. The state route ends at Coral Lane, a short distance north of the Currituck Beach Lighthouse at Corolla Light. NC SR 1437 extends 0.6 miles northward from N.C. 12 in Corolla to North Beach Access Road, a paved road to the Ocean Hills community. The access road ends at the beach, which is driveable by four-wheel drive vehicles northward from there to the community of Carava. South of Whalebone Junction, North Carolina 12 enters Cape Hatteras National Seashore via Cape Hatteras National Park Road. Posted with a 55 mile per hour speed limit, the two lane highway stays west of built up areas along Bodie Island through to Bodie Island Lighthouse Road. South of the U.S. Coast Guard Station, N.C. 12 makes a sweeping S-curve across Oregon Inlet on the Herbert C. Bonner Bridge. The 2003 landfall of Hurricane Isabel further increased erosion issues along North Carolina 12. Storm surge from the category two storm carved out two new inlets across Hatteras Island National Seashore, cutting off Buxton, Hatteras, Rodanthe, Waves and Salvo from the North Carolina mainland. Heated debate grew after the storms departure on whether or not to build new bridges over the new waterways, or to backfill them and restore North Carolina 12 onto its original roadway. After several months of debate, the U.S. Army Core of Engineers agreed to fill in the inlets and reconstruct North Carolina 12 as it was. A final design for the Bonner Bridge replacement was selected, and the North Carolina Department of Transportation awarded a design-build contract for the new span in July 2011. Costing $246 million, the Bonner Bridge Replacement Project constructs a new span between 50 and 189 feet west of the original. Factoring in the new approach roadways, the project totals 3.5 miles in length. The 3,500 foot long bridge includes seven navigational spans at an average width of 300 feet, compared to the single 130 foot wide navigational span on the predecessor bridge. Following law suits filed in 2011 and August 2013, groundbreaking for the new Oregon Inlet Bridge finally took place on March 8, 2016. The new bridge with two 12-foot travel lanes with 8 foot-wide outside shoulders is expected to open in Fall 2018. The 1964-bridge will be partially demolished, with segments used at offshore reef sites. A 1,000 feet or so section of the old span will be retained and repurposed for pedestrians. Overall project work continues through 2019. 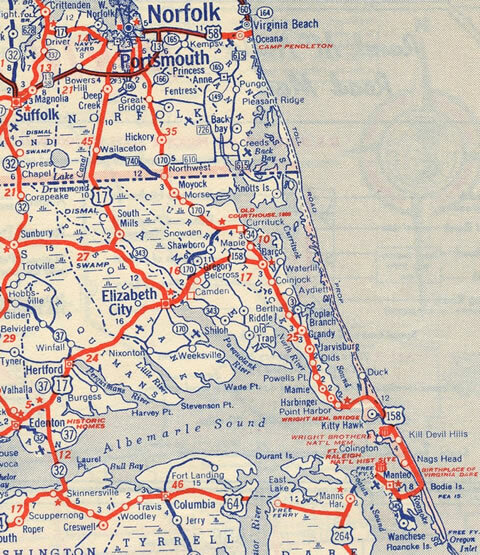 The 1950 Rand McNally North American Road Atlas displays a proposed toll road extending north along what is now North Carolina 12 between Southern Shores and Corolla, and along the beach areas from Carova north to Virginia Beach, Virginia. This alignment was dropped by the 1954 edition. Several proposals emerged to build a new bridge across Currituck Sound to North Carolina 12 and Corolla with U.S. 158 on the Currituck County mainland. Opponents contended that this road would only benefit tourists from Virginia, and further spur development along North Carolina 12 south along Bodie Island. One of nine projects developed by the North Carolina Turnpike Authority was a new tolled span across Currituck Sound linking U.S. 158 with North Carolina 12. If built the Mid-Currituck Bridge will travel approximately seven miles from a point north of Aydlett to an area at or south of Corolla. The Final Environmental Impact Statement (FEIS) was completed in January 2012. Although initial thoughts on construction touted a possible completion date in 2013, the Record of Decision process continued through the spring of 2018. Proposed tolls forecast in 2009 varied between $8 each way during the tourist season and $6 each way during off-season.4 The estimated toll rate was not determined as of 2017. Cost estimates for the new crossing are $440-million. North Carolina 34 constitutes a north-south highway between U.S. 158 near Belcross and North Carolina 168 at Sligo. Prior to 2006, North Carolina 34 overlapped with U.S. 158 west 5.4 miles to Water Street in Downtown Elizabeth City. The state route circled around Downtown along Water Street south and Eringhaus Street west to U.S. 17 Business at Road Street. The state route then followed Road Street south to Herrington Road and Elizabeth City State University. Southeast from Elizabeth City, North Carolina 34 extended along Weeksville Road to U.S.C.G. Air Station Elizabeth City and areas along Newbegun Creek through to Salem Church Road. The state route turned east along Salem Church Road to Salem, and south to Soundneck Road for its final length to Glen Cove on the Pasquotank River. 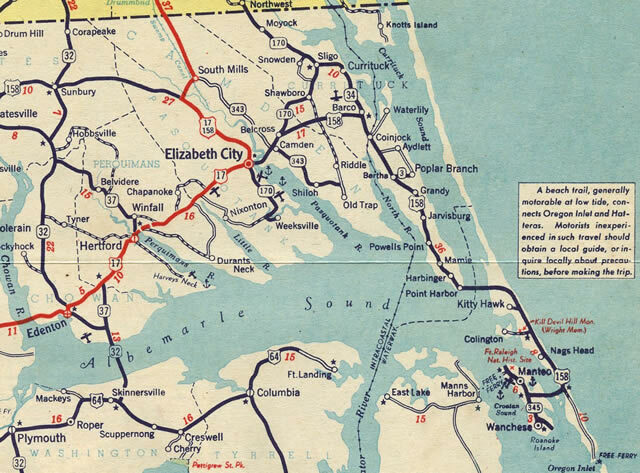 Historically N.C. 34 represented the lone route connecting the North Carolina main land with the Outer Banks. The state route was the predecessor to U.S. 158 from Barco south to Bodie Island, and also along the hook west to Manteo. This changed in 1940, with N.C. 34 shortened to just ten miles between Sligo and Barco. North Carolina 136 constitutes a 2.2-mile long route spurring east from U.S. 158 at Bertha to Poplar Branch in Currituck County. The two-lane route stems east from U.S. 158 along Macedonia Church Road and north along Poplar Branch Road through a mix of forest land, agricultural areas, and by several homes and an elementary school. North Carolina 136 ends at the Currituck Sound boat launch ramp at Poplar Branch Landing. As a tribute to the North Carolina native and NASCAR racing legend Dale Earnhardt, the state agreed to allow the city of Kannapolis (Dale’s hometown) to renumber North Carolina 136 as North Carolina 3 to honor Earnhardt. The change was made by October 23, 2002, a year and a half after Earnhardt’s death at the 2001 Daytona 500.3 Signs were changed by March 2003. There was only one North Carolina 3 shield posted in each direction of the state route between Bertha and Poplar Branch in 2001. The westbound assembly stood just beyond the Poplar Branch boat ramp to Currituck Sound. Photo taken 12/17/01. A five lane arterial linking Chesapeake, Virginia with Currituck County, North Carolina, North Carolina 168 provides the main route to the Outer Banks from Virginia and the overall Mid-Atlantic region. Despite the high volume of traffic during the tourist season, the road remains rural in character outside of the Moyock community near the Virginia state line. Accommodating growth in the resort areas to the southeast, the state route was widening from two to five lanes in the early 1990s. 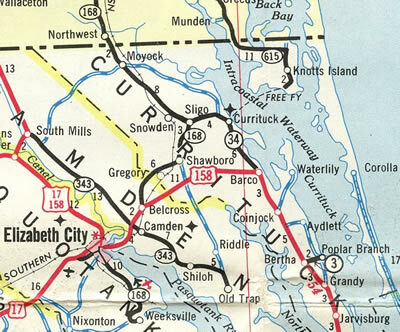 Prior to 1979, North Carolina 168 followed what is now North Carolina 34 from Sligo southward to U.S. 158, and the US highway west into Elizabeth City.10 The route continued south along what was North Carolina 34 on a combination of Waters and Ehringhaus Streets around the city center, and on Road Street and Herrington Road to what is now North Carolina 344. N.C. 168 followed Weeksville Road (N.C. 344) south from Elizabeth City to end in Weeksville. All of this former route of N.C. 168, and the portion north from Sligo was previously numbered as N.C. 170. N.C. 170 formed a multi state route with Virginia 170 in Chesapeake. N.C. 168 (Caratoke Highway) northbound at N.C. 34 (Shawboro Road) south in Sligo. N.C. 168 constitutes a five-lane arterial northwest from Barco to Chesapeake, Virginia. N.C. 34 leads three miles south to Shawboro. Photo taken 12/17/01. Puddin Ridge Road intersects North Carolina 168 (Caratoke Highway) at one of the traffic lights within the community of Moyock. Photo taken 08/24/09. North Carolina 168 (Caratoke Highway) reaches the Virginia state line at North Point Boulevard by the Border Station store (the store is bisected by the state boundary). Virginia 168 begins here and travels a short distance onto the tolled Chesapeake Expressway Photo taken 08/24/09. A vastly rural highway, North Carolina 343 parallels the Pasquotank River along a 25.5 mile course from Old Trap to U.S. 17 near South Mills. The highway provides part of an alternate route to the Outer Banks from U.S. 17 and Suffolk, Virginia to U.S. 158 at Camden. South of Camden, the state route winds across an agricultural peninsula to the settlements of Taylors beach and Shiloh, ending south of Alder Branch at at Texas Road (SR 1100). North Carolina 343 travels wholly within Pasquotank County along a 20.9 mile route. The state route connects rural areas on the peninsula between the Little and Pasquotank Rivers with Elizabeth City. Halstead Boulevard takes the route northwest along a commercial strip between Roanoke Avenue and U.S. 17 (Hughes Boulevard). Halstead Boulevard Extension continues North Carolina 343 west to a diamond interchange with U.S. 17 Business (Future I-87). The four-lane arterial opened up agricultural areas for development with big box retail, apartments and subdivisions added. The 3.7-mile long Halstead Boulevard Extension opened to traffic east from U.S. 17 Bypass to the intersection of Halstead and Hughes Boulevards on May 2, 2004. The arterial was initially designated as a North Carolina secondary route. Coinciding with a $100,000 project to install 13 new signs along the U.S. 17 Bypass freeway, the North Carolina Department of Transportation outlined two possibilities to upgrade Halstead Boulevard Extension into a primary state route. The first alternative proposed the establishment of a new route number for both Halstead Boulevard Extension, and what was North Carolina 34 from Halstead Boulevard to the south end of Pasquotank County. This option retained North Carolina 34 northward from Halstead Boulevard along Herrington Road and to U.S. 158 through Downtown Elizabeth City. Looking at what was the first northbound North Carolina 34 reassurance shield, posted a short distance from the Pasquotank River shoreline at Aline Drive. A begin shield for North Carolina 344 stands here now. Photo taken 03/31/01. N.C. 344 (former N.C. 34) leaves the city of Elizabeth City and the U.S. Coast Guard Station area and transitions into a rural two lane roadway. The final shield for N.C. 34 south stood beyond the turn from Salem Church Road onto Soundneck Road. Photo taken 03/31/01. North Carolina 345 comprises a 4.7-mile long route on Roanoke Island, linking U.S. 64 at Manteo with Wanchese and Mill Landing. Speed limits range between 35 and 55 miles per hour along the two lane highway. Before the extensions of U.S. 64 east across Croatan Sound was completed, North Carolina 345 continued to the north end of Roanoke Island to Fort Raleigh National Historic Site. A remnant of the former alignment is Old NC 345 branching north from U.S. 64 Business just outside the park. According to a USGS Topographic map, N.C. 345 may have followed Old Wharf Road west from Mill Landing Road to end on the Croatan Soundside of Roanoke Island. This southbound reassurance shield after the split of Old Wharf Road from Mill landing Road in Wanchese was removed when the road was expanded to include a northbound turn lane. North Carolina 345 follows Mill landing Road south to end at the intersection of Thicket Lump Drive south and The Lane north. Photo taken 04/05/01. The first confirming marker for N.C. 345 stands beyond the merge of Mill Landing and Old Wharf Roads in Wanchese. The state route traverses wetland and forest land northward to U.S. 64. Photo taken 12/26/00. Within the town of Manteo, North Carolina 400 constitutes a 0.9-mile loop east from U.S. 64 Business to Roanoke Island Festival Park. The state route follows Fernando Street east and Queen Elizabeth Avenue north to Ananias Dare Street at the Doughs Creek bridge to Roanoke Island Festival Park. Ananias Dare Street returns North Carolina 400 west to U.S. 64 Business. North Carolina 615 extends south onto Morse Point from Princess Anne Road (former Virginia Secondary 615) in Virginia Beach, Virginia. Turning east along Marsh Causeway, the 9.1-mile long state route traverses Great Marsh and Mackay Island National Wildlife Refuge onto Knotts Island. Knotts Island Road leads N.C. 615 south by the community of Knotts Island to South End and Woodleigh Roads. The state route arcs east on South End Road across a mix of forest and farm land through to Ferry Dock Road, which connects with the Currituck-Knotts Island Ferry landing to North Carolina 168 at Currituck. Lansford, John. “NC 12 fix not easy,” Online posting, misc.transport.road. January 15, 2004. “Mid-Currituck Bridge nearly ready to roll.” The Virginia-Pilot, November 15, 2009. “Hurricane Irene Breaches Outer Banks.” NASA Earth Observatory, August 28, 2011. “More Tourism is Hope as Dare Bridge Opens – U.S. 64 Span Should Reduce Isolation and Speed Evacuations.” The Charlotte Observer (NC), August 17, 2002. “Opening of EC bypass is delayed.” The Daily Advance (Elizabeth City, NC), August 6, 2002. “Officals celebrate bypass’ opening.” The Daily Advance (Elizabeth City, NC), December 4, 2002. “Halstead connector road to open May 2, DOT says.” The Daily Advance (Elizabeth City, NC), April 9, 2004. “State to put 13 signs on bypass.” The Daily Advance (Elizabeth City, NC), December 19, 2004. US158 over INTRACOASTAL WATERWAY. UglyBridges.com. Page Updated February 13, 2018.